If you ever find yourself with some extra time on your hands, you might want to consider hopping over to Municode and checking out how your neighborhood is zoned. Do they allow dance halls? If so, what if they exceed 5000 square feet? How about veterinarians? Are they allowed to have tracks for animals to run on? Let's hope the crematorium check box is left blank - not even a special use permit for that one. Charlottesville has 14 different mixed-use corridors. I don't want to make fun of this at all. It's great that this city has seen the need to overlap some of these uses and generate synergy in key parts of the city. Still, I wonder exactly how the decisions are made for what will be allowed in each district. An area I'm currently studying is the only mixed-use district to strictly forbid libraries. Yes ... libraries. Did someone from this neighborhood petition the City Council to keep all books out of his backyard? Were protestors carrying "down with libraries" placards? Or perhaps a planner working late into the night before a city council presentation simply forgot to mark the library box on the speadsheet, and the prohibition has become codified for all posterity. I wonder how many of these idiosyncrecies are passed down from some ordinance written in 1919 (because Ebenezer Longfellow strongly believed libraries induced lascivious behavior). The occasion never really arose to address the issue, and even if it did nobody was really passionate enough to demand that anyone change it. 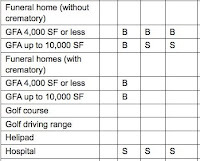 When the zoning was rewritten in 1953, the boring parts were faxsimiled into a new chart. In 1986, it was simply a matter of copying into the PC clipboard and pasting onto a new spreadsheet. And now we have a living tradition of all of the hopes, fears, and couldn't-care-less attitudes of a community's desires for its land. One of the most startling items that you will see in zoning codes around the country is the number of required parking spots for X bar stools in a bar! Umm so we actually encourage people to drive to the bar. Is a dead-end public or private?